| WORTH IT WEDNESDAY | Jergens Natural Glow Moisturizer! Summer is almost here, which means its time to get your tan on! Unfortunately, spending a lot of time in the sun without sunscreen isn’t recommended because of the risk of skin cancer and tanning beds aren’t a safe idea either because of the huge exposure to UV rays. So, how’s a girl to get that beautiful, glowing skin everyone wants? That’s where self-tanners come into play. There is a large variety of brands and types to choose from. Some work instantly, some are more gradual. Some wash off at the end of the day, others last for a few. 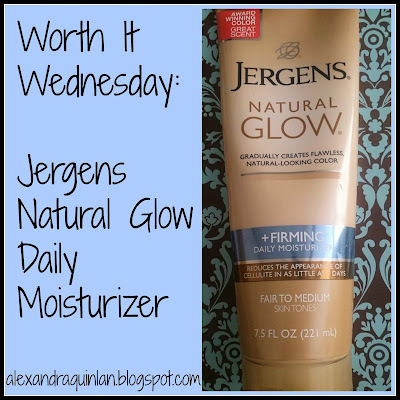 For this week’s WORTH IT WEDNESDAY I’m going to be talking about Jergens Natural Glow Moisturizer, and I’m going to let you know if its worth it or not! Jergens Natural Glow is supposed to be used as your everyday moisturizer and over the course of a couple of days you will begin to see your skin develop a natural tan. They offer two different skin-tone types. One for fair to medium, one for medium to dark. You’re supposed to just put it on like a lotion, allow it to dry for a few minutes before dressing, and wash your hands immediately after. Using the product daily, it’s supposed to gradually darken your skin, but its supposed to look natural too. So do this actually work? It does! I’ve actually been using this stuff for almost 6 years and I love it! It’s my go to for this time of year where it’s time to start wearing shorts, skirts, and dresses but I haven’t had the chance to get any sun yet. It always looks natural, never orange, and it’s really easy to use. It’s also super affordable. Most drugstores carry it for about $10. I’ve seen other products that do the same thing with a price tag that’s more than double what this costs. So…is this product worth it? Absolutely! For just $10 and a few days you can have a beautiful, natural tan without having to go out in the sun. It’s easier than spray tans and cheaper. It’s safer than getting into a tanning bed, and it’s probably the cheapest self tanning lotion you can find. The only con is that you need to be careful and patient when using it to avoid getting streaky skin. You want to make sure you cover yourself evenly, so that might take some time. For me, the total application process takes about 10-15 minutes. Also keep in mind that this product may not be for you if you’re looking for an immediate or over-night tan. It takes a few days for color to show up and if you need a tan for an event and you’re planning to use this, you should start applying a week in advance. Another thing to remember is, that if you stop using this product, your color will fade in a few days. If you want to maintain your color, you need to use it every single day. I would definitely recommend this product to anyone who’s looking to get an easy, natural tan within a week. – Use an exfoliating body wash before putting this product on. Just like your face, you always want to exfoliate before moisturizing. It will help to prevent the product from becoming streaky on your skin and allow for an even application. – This product goes on the skin clear, so pay attention to how much and where you’re applying it to avoid streaks and to avoid making some areas darker than others. – Don’t use much on bony areas of your body such as your knees and ankles, the color will always look darker there. – Wash your hands immediately after applying. You don’t want to stain the palms of your hands or get any excess product on your body. For prices and more information, check out the website here! Let me know if you’ve tried this product before and what you think of it? Do you think it’s worth it? What are some of your favorite self-tanning products?